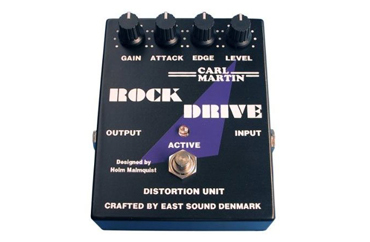 The Carl Martin Rock Drive is a 9V-battery-powered pedal designed to emulate the sound of a hard driven tube amp, responsive to individual playing dynamics without altering the basic tone of the guitar. The Attack (mid) and Edge (treble) controls give access to a variety of flavours within this type of distortion style, without compromising sonic quality. The Carl Martin Rock Drive is capable of emulating tones from a smoking Twin to a beefed up JCM 800, without low-string mush or raspy highs.